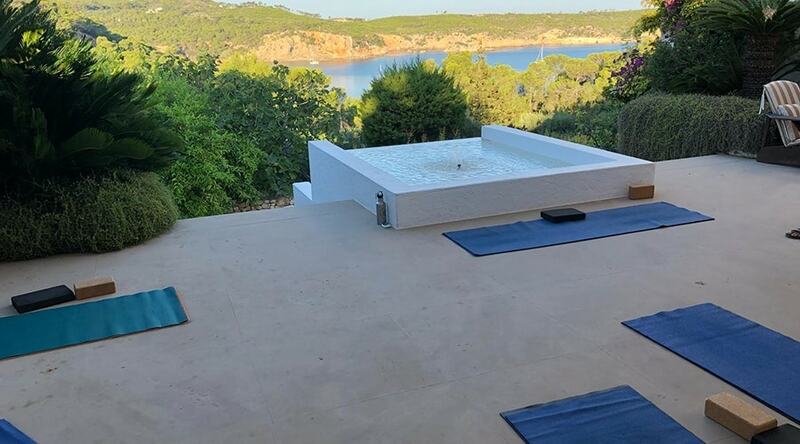 Selda Goodwin reviews an energising and luxurious dance retreat with Santhosh on Ibiza and finds joy, fantastic food, expert teachers and the true beauty of dance. 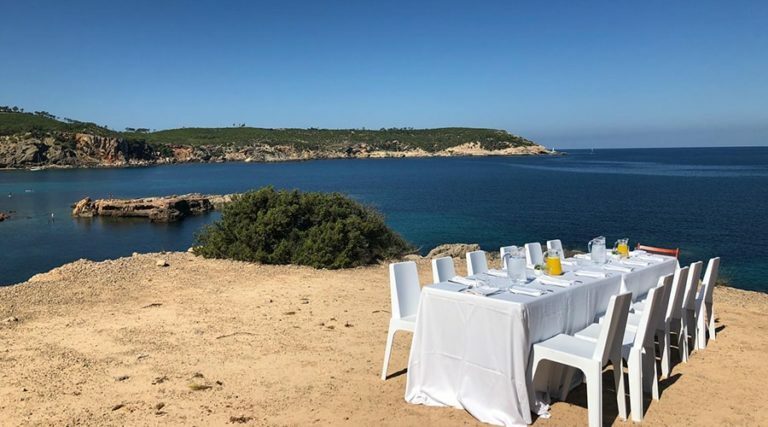 Something about the North of Ibiza whisks me into a romantic whirlwind, and as I enter the extraordinary home of Sri Lankan born Samiya, accept a proffered glass of cool crisp champagne, and am invited to breathe in the magnetic views of ancient pines, crepuscular rays and the iridescent coastline, I know the bar is high. 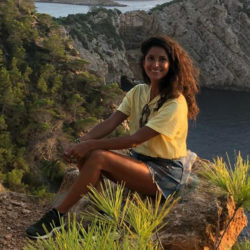 I’m here to experience a four night dance retreat with Santhosh, which means happiness in Sanskrit, an emotion lovingly inscribed into the polished plaster walls of Samiya’s home, a luxury Spanish finca situated on the north coast of Ibiza, near Portinax, between Cala Xucla and Cala Xarraca. Casa la Vista has direct access to the Mediterranean sea, a large and inviting infinity swimming pool, several courtyard gardens and is set within its privately-owned 30 acres of fragrant pine forest. My room is quaint and characterful – a converted horses barn with a stone washed white wall exterior, draped with pink and purple bougainvillea hanging over a bench by the front door. A typical day begins with breakfast at 7.45am, followed by yoga at 9.15am for 90 minutes. Most days the group dance class will be either after yoga or after in the afternoon, and therapies are timetabled around these classes. We enjoy leisurely lunches at 12.15pm, and dinner is at 8.30pm. 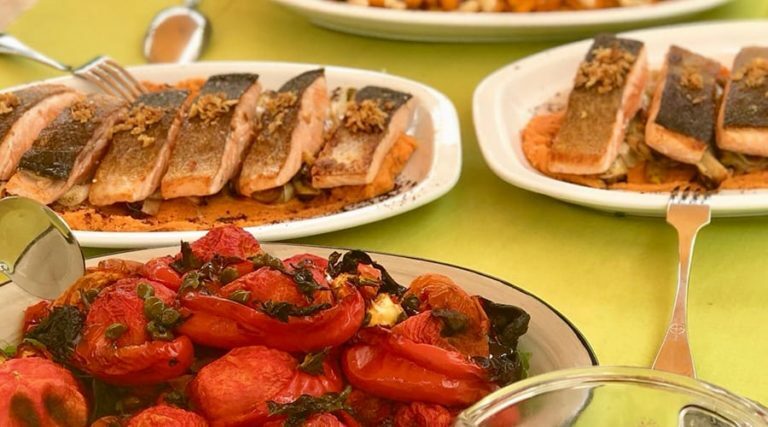 The two private sessions that are included in the package are slotted cleverly into the schedule around mealtimes and other activities. Social dancing after dinner each night is an optional group gathering. By 11.30pm, I am happy but ready for bed. I quickly slip into a rhythm. As a yoga, meditation and sound practitioner of 16 years, and a lifetime away from the young dancer that I once was, many learned philosophies and training programmes have conditioned my body and mind. 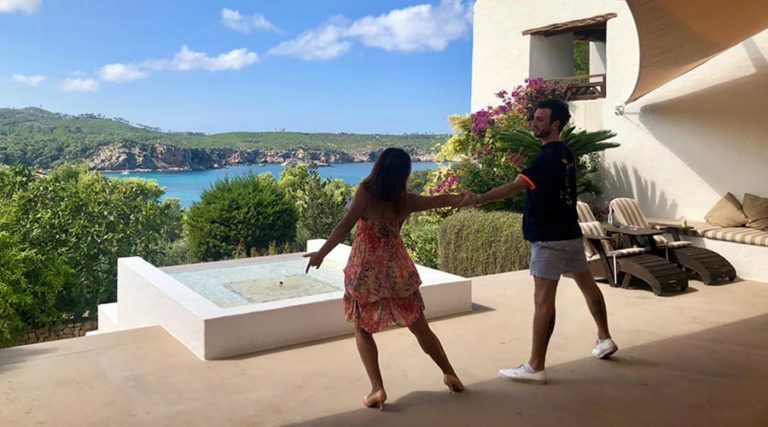 But as I sway across the terrace in my first ever Waltz moments after dessert on my first evening, my body whispers gently with joy and I connect to the true beauty of dance, a dance of my life that cannot be learnt in the conventional way. This movement of life can only be felt with the energy of the heart, or as Samiya describes, the ‘knowledge of the heart’. A physical and spiritual intelligence that emanates from my centre and invites my body to follow, even when I’m not entirely sure of what I’m doing. There is palpable passion here as talented London based dance instructors take my hand with care and grace, until the music lulls me into a state of effortlessness. With genuine compassion my many mistakes are met with ‘that’s great’ or ‘perfect’. What joy! With no rules, only incandescent moves under the pomegranate tree as Latvian born, urban hip hop genius Ed, tenderly leads me through a private session. The dance is Zouk, a contemporary, soulful exchange that originates from Brazil. Full of information, keen for me to grasp details others may not teach, the music starts, the serenity of the warm air takes over and Ed’s kind approach guides me into a space of trust. On day two shortly after lunch, I experience my second private class with big-hearted Portuguese showman Nuno. He has me shimmying in no time to his cleverly choreographed, somewhat saucy cabaret, accompanied by Christina Aguilera’s ‘Good girl’. The rainbow spectrum of creatively made lunchtime salads, Spanish tortilla and sweet potato and butternut squash soup all charge my appetite. But the Japanese night is a clear winner – miso, edamame, sushi and tofu followed by sesame crusted seared tuna. The food makes my body sing and despite being royally satiated, an avocado, cacao and date base dessert completes the evening meal, before I’m offered a hand to dance again. After many attempts to turn in, having been so easily swayed into one more dance for over an hour, bed finally calls. My snug converted horses barn has a simple charm, and the small luminous skylight soothes me into a restful night’s sleep. I wake eagerly to the rising sun and a breakfast spread fit for Kings and Queens, with one question on my lips. Shall we dance? I see that I must continue every day to dance with my heart, in the great rousing music and be sure not to miss a step. Santhosh dance retreat is like a child who thinks not of the ‘right steps’ but moves with music and joy, reminding us to dance freely through life and from the heart. There are seven of us, an inspiring team (from early thirties to mid fifties) of female lawyers, full-time mums and independent brand owners, some with dance experience, others first timers, all relaxed and ready to take on whatever life throws at them. In this case, Salsa, Zumba, Cha cha cha, American smooth and more. Sharing moves, sharing meals, sharing stories. Isn’t this what community is? Isn’t this how we form bonds with ourselves as well as others? Over the course of the retreat a love of movement is expressed through pearls of perspiration. My hips sway in time with the ocean and the breeze melts me into a trance as I begin to surrender. I’m spinning and stepping in time to a rhythm that has its own divine flow and whichever way I move, side to side, three steps forward or back, I notice a pure joy drawing up from within and without effort I know parts of me are truly shining. On my final evening with the group, Gigo from Georgia, with his tall, dark, tango poise, twirls me round the full moonlit poolside dinner table to La La land’s theme tune, as the guests smile with encouragement.